That Daily Deal started their new, low cost, dog box back in February – Mini Monthly Mystery Box For Dogs. 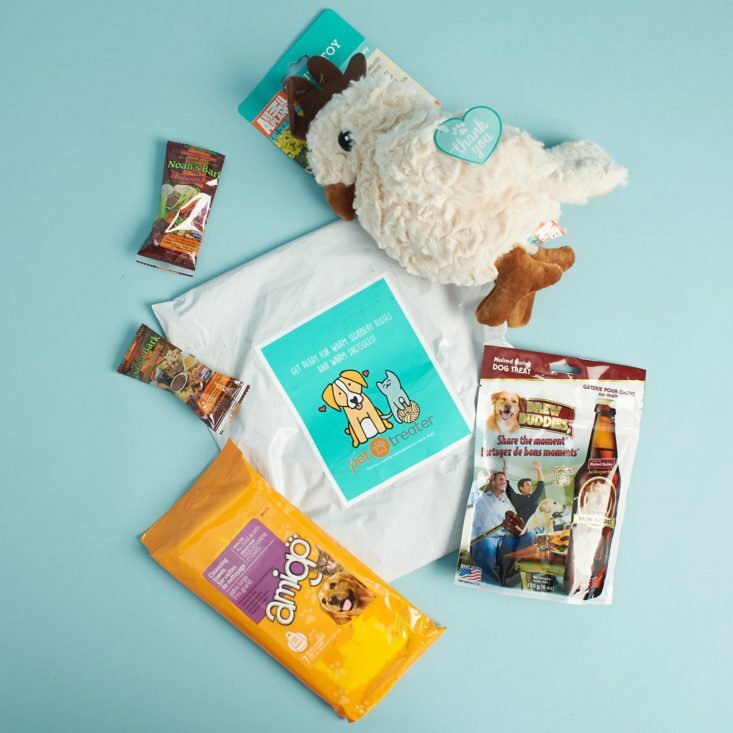 This goes along with their other monthly mystery boxes: Monthly Mystery Box of Awesome and Mini Monthly Mystery Box of Awesome – this one is focused on a lower cost option from their Pet Treater subscription for your pup. My Subscription Addiction paid for this box. (Check out our review process post to learn more about how we review boxes). Love your dog but don’t need a BIG box of stuff every month? This is for you! Treat your pup for $9.99/mo delivered! Receive at LEAST 1 bag of treats (all made in USA or Canada) and one toy – The retail value is always worth more than $10 AND we ship it free! No dealing with traffic going to the store and no more paying insane pet store pricing! Access to secret deals and add-ons! Most important? Have something special for your pup every month like clockwork! Check out all of our Mini Monthly Mystery Box For Dogs Reviews to get more information on this subscription. Check out all of our Pet Subscription Boxes in the Subscription Box List. Rate, review, and follow this subscription on the Mini Monthly Mystery Box For Dogs profile page. The typical delivery will have 2-3 items that stay around the same total value. Each item is a mystery without any type of theme. They’ve rebranded a bit since it’s now labeled as Pet Treater – but this is still the $10 monthly option. Buckles is ready – let’s go! This month comes with a super soft plush toy! It’s got a few squeakers inside and nothing hard to ruin your dog’s chewing time. While this one was on the bigger side of a toy that Buckles would like – he seemed to really go after it! It also included one full-size bag of treats that let your pup enjoy some brew time with you. They’re even shaped like little beer bottles. These things REALLY smell – and not in a beer way! Buckles’ eyes lit up when he got a sniff though! Overall, he liked the treats, but the smell was so strong that we had to shelf these ones. There are two individually wrapped bones, too. The first is peanut butter flavored. While Buckles typically doesn’t even want bones – he jumped all over both options! And the second bone is a more classic, beef flavor. He loved both – it was an unusual win for us! Finally, you’ll get something super useful for you and your dog – a pack of cleansing towels. You never have them when you need them, and these are a good size to carry around or put in the car, so it’s a perfect item! Verdict: This is one of the best low-cost dog box options! At $10, we’ve always got over contents over the cost of the box – each month has been a win! What did you think of the December 2017 Mini Monthly Mystery Box For Dogs? Buckles is such a cutie! I just love this box. It’s the best money I spend subscription wise. Bam Bam is always nosing into my boxes and so when this one comes and it’s all for him he is in heaven. We almost always love everything they send and he is picky eater so to get new treats that he loves is a total win!! I would like to see Buckles model all the products ypu guys review. He’s so cute. Me too! Buckles is adorable!!! Great review, Buckles. As always. But, remember, never Brew Buddy treat and drive.